Normandy is justly famous for its horses and stud farms, and just north of Alençon is the most famous and spectacular stud farm in all of France – the Haras du Pin, one of only two whose buildings are also listed on the French National Monuments register (the other is Compiègne). There are 19 national stud farms dotted all over France whose purpose is to improve and promote French horse breeding. Near the small town of Le Pin, the Haras du Pin is more than a centre for horse breeding – there are also displays of horseriding and carriage driving throughout most of the year. The Royal Stud Farms were originally created in the 17th century to provide the army with a reliable supply of quality horses. They were reorganised in 1806 by Napoleon with the same purpose, i.e. the production of horses for military campaigns. 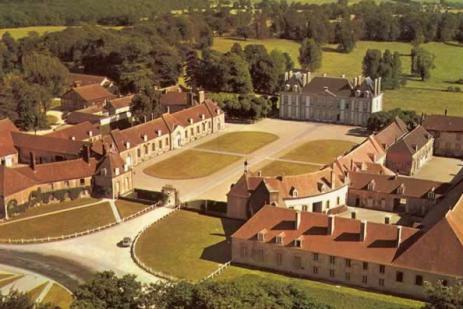 They became “Haras Nationaux” (National Stud Farms) in 1874. The Haras du Pin was founded by Colbert in 1665 and approved by Louis XIV in 1715; it soon became known as the Versailles of the horse world, due to its stunning buildings and beautiful grounds, unequalled by any other Haras in France. Its parklands extend over a thousand hectares (two and a half thousand acres). It is the most ancient and prestigious of the present day Haras Nationaux. The Percheron, the Trotteur Français, the Selle Français and the English Thoroughbred are the main breeds held at the Haras du Pin. Together with the collection of horse-drawn vehicles, they are the centre of displays every Thursday at 3 p.m. from June to September, when the 18th century courtyard of the Haras du Pin becomes the stage for handling, riding and carriage driving displays. The chateau, stables, saddlery and other buildings are also open to the public. In September and October there are horse races at the “Bergerie” racecourse, located down “Racing Avenue”, 3 km east of the Haras. The Bergerie is one of the oldest and most prestigious racecourses in France, where the first flat and steeplechase races took place in Normandy in the early 19th Century. An International carriage driving competition is also held at the Haras du Pin itself in July and a special competition for the Percheron breed on the last Friday and Saturday of September.